What makes potatoes “scalloped”? What’s a “gratin”? Who cares! * I had some leftover potatoes and half-and-half from making clam chowder, and I had wanted to make potato gratin for a while, so tonight’s meal provided the perfect opportunity to make that happen. Preheat the oven to 350 degrees. Take a wide baking pan (wider so there is more surface area and more potatoes will brown) and generously butter the bottom of the pan – I also added chopped up garlic. Then, layer overlapping potatoes on the bottom, and then season that layer with salt and pepper. Then, add another couple of layers of thinly-sliced potatoes on top, and season again, and this time add some cheese too. Meanwhile, simmer some half-and-half with some garlic and shallots. When the pan is covered in potatoes, then pour the half-and-half mixture into the baking pan, until there is enough half-and-half to cover just below the top layer of potatoes. Cover the baking pan with foil, and then bake for about an hour, until the potatoes feel tender when poked with a knife. After the potatoes feel tender, remove the baking pan from the oven and then remove the foil. Increase the heat of the oven to 425 degrees. At this time, you can add another layer of cheese on the top layer of potatoes, if desired. Then, put the baking pan back into the oven, until the top is brown and bubbly, about 15-20 minutes. Remove from the oven and let it sit for about 5-10 minutes and then serve. *Also from Wikipedia: Gratin is a widely used culinary technique in food preparation in which an ingredient is topped with a browned crust, often using breadcrumbs, grated cheese, egg and/or butter. 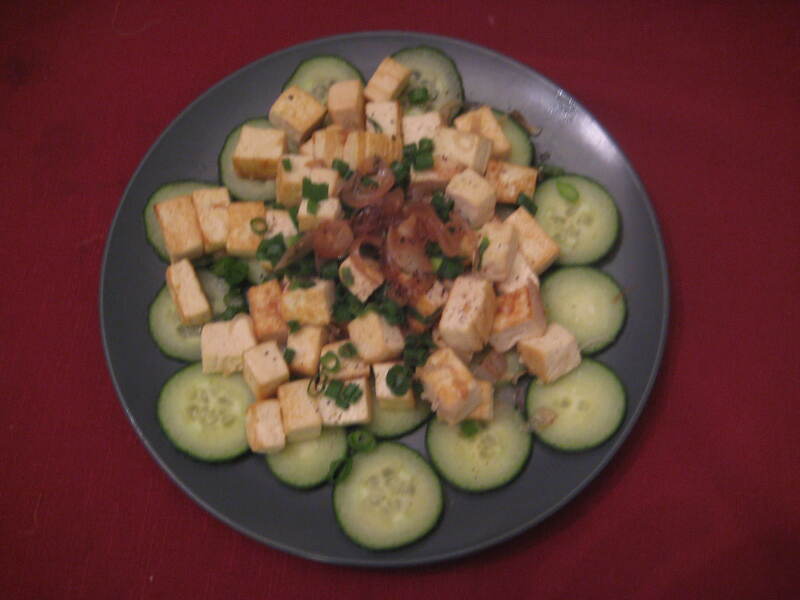 -Tuesday, July 5, 2011: Made the potatoes along with a simple pan-fried tofu dish (with garlic and shallots), layered on top of raw cucumbers (and served with a soy sauce, sesame oil, honey and rice wine vinegar sauce) (picture below). 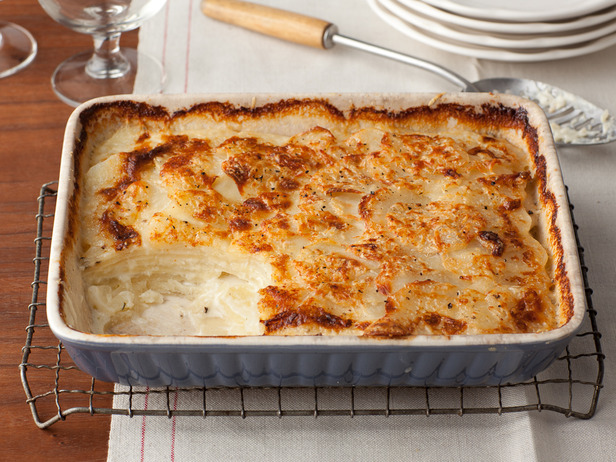 This entry was posted in Main Dish, Side Dish and tagged Gratin, Half and Half, Potatoes, Scalloped. Bookmark the permalink.